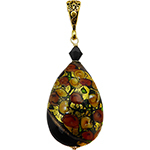 Use our Free Design Instructions for our Murano Glass Pendants, featuring Swarovski Crystal Elements, Murano Glass Beads and TierraCast Findings. DIY is a great project for mother and daughters or a group of Friends. Select a design and have a girls night making wearable art.